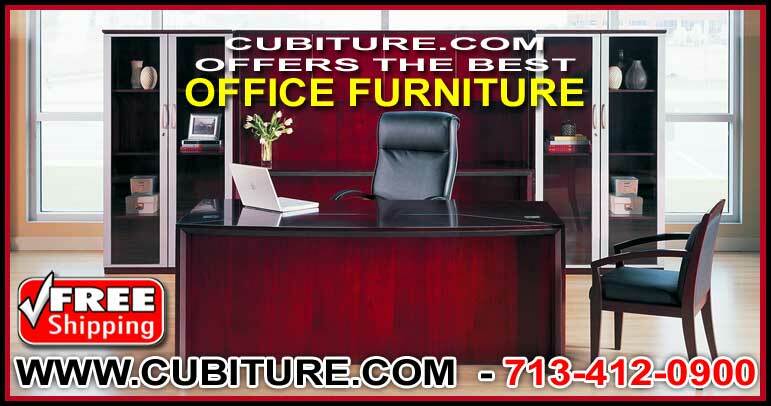 HR managers can find the best office furniture here at Cubiture.com. We carry a complete selection of office chairs, office desks, cubicle workstations, conference room tables, filing systems, and reception centers. Cubiture represents over 500 manufacturers and owns its own fabrication plant. We can essentially order or build any piece of office furniture a customer requests. With our own fleet of trucks, we can deliver and install entire furniture systems with turnkey convenience and discount pricing. We make it a point to sell office chairs rated for an 8-hour workday. While discount office chairs are abundant through a variety of online sources, not all of these are rated at 8-hours. All too often, we hear from customers who complain that their chairs cause backaches and leg cramps. When we examine these chairs, we find they are rated only for a 5-hour day. If you are going to spend the money on the best office furniture, make sure you invest in the best chairs to go with it. Comfort is essential to productivity because employs will stay seated longer and remain upbeat and focused when seated in ergonomic chairs. With Cubiture, you can find conference tables of any size. We have tables for large conference centers as well as smaller tables for use in collaborative environments. Because we represent the best office furniture manufacturers in the world, we can order any name brand table you find online and deliver it turnkey to your office. We can also build you a table based upon a picture you send us. Our fabrication facility allows us to manufacture tables of any size from any type of material. Because we can sell our own products directly to our customers, these custom jobs are typically less than you would pay for another manufacturer that sells only through a retail distributor. We often use the term “reception center” instead of “reception desk.” This is because many of our clients here in Houston work in banking or healthcare and need more than just a receptionist desk to do their jobs. While many of our reception centers are ordered from some of the best office furniture sources in the world, many more are custom built by our own employees here in our Houston fabrication center. If you need a new reception center for your law firm, advertising company, healthcare facility, or bank, call and ask for a free space plan drawing courtesy of Cubiture.com. We can design you a system based upon your workflow and scale the cost to budget tolerance. What makes a desking system different from an office desk? Simple. The word “system” makes it different. Desking systems provide more than a horizontal work surface. They also contain filing and storage units that allow professionals to retrieve supplies and documents with minimal effort and movement. Many of our desking systems are designed to wrap around corners so that wall space that would otherwise be wasted can be used for production. Traditional and contemporary office desks can also be ordered through our retail distribution division from any number of the best office furniture sources in the world. The very name “Cubiture” refers to our outstanding reputation in cubicle manufacturing, installation, and repair. Since our inception, we have specialized in building cubicles tailored to the specific needs of financial services professionals, healthcare administrative staff, sales agents, and customer service call center staff. Our team is not only well versed in building cubicles, but they are highly trained and experienced in cubicle refurbishing and repair. If you need new cubicle systems, start with a Cubiture space plan that will maximize your workflow with workstations built specifically to individual job task completion. Before Cubiture was founded, Jerry Mogyorody, our CEO, worked as a high-density filing specialist. Jerry’s experience in high-density filing has enabled him to create the most advanced space saving solutions for Cubiture clients. Jerry’s passion is reducing the amount of square footage used by filing systems so that more office space can be used for production. At your request, Jerry will conduct a square footage utilization assessment and have his space planners design a new storage and filing solution that will save you time and eliminate clutter. This service defines us as one of the best office furniture sources in the country. With our own trucks, we can deliver anywhere in the country. We also offer furniture moving services priced by the hour or at a flat rate (whichever works for you.) Call Cubiture now to start planning your new office layout, and get the best office furniture for your needs delivered straight to your door.